Successfully Added 3D Modeling Stereoscopic Printing Pen - Drawing/Arts/Crafts, 3 Free Filaments to your Shopping Cart. There is now a quick and easy way to bring some of your more creative ideas to life – the 3D Stereoscopic Printing Pen. Instead of making a flat paper drawing, you can now create real-life 3D objects right from your imagination. Perfect for kids and adults alike, it’s a perfect tool for modeling, design and a great number of other creative projects. There are of applications for the simple and innovative gadget. You can use it to bring any of your concepts to the real world and see how they would look as real-life objects. The extruding pen is the perfect working tool for anyone who works in design and modeling, hobbyists, students, kids, and all those with a creative streak. Working with the pen is super simple. It uses melted plastic instead of ink to create 3D objects. Just press it down on paper and start drawing as you would with a standard pen or pencil. Then, lift the pen in the air and keep going – you will see the model of your idea come to life right before your eyes. Designers can use the tool to test out their models, hobbyists to give shape to their imagination, students to work on their projects, and for children it can become the ultimate learning tool. One of the highlights of this 3D Stereoscopic Pen is its ergonomic lightweight design. Weighing under 50 grams, the pen is super easy to hold and use, and will feel natural in your hand, letting you conveniently work on your creations. The 3D Printing Pen comes with a 0.7mm nozzle, speed control and adjustable temperature. You will also get 3 free filaments together with the extruding pen, so that you can start creating right away. 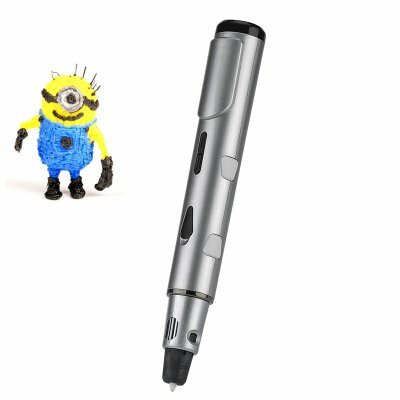 The 3D Stereoscopic Pen comes with 12 months warranty. Brought to you by the leader in electronic devices as well as wholesale 3D stereoscopic pens, Chinavasion..